China's security watchdog cracked down on the country's largest brokerage firms. The Shanghai Composite Index drops 7.7 per cent, its biggest loss since 2008. 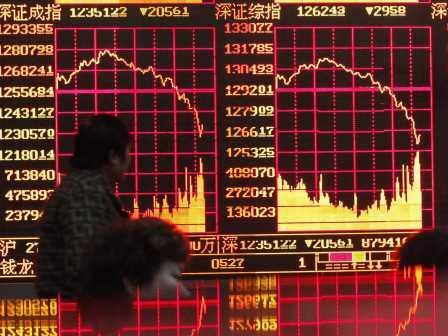 China's second exchange, the Shenzhen Composite Index, also falls by 3.41 per cent. The property market is also in major trouble as one of its main players fails to meet interest payments. Beijing (AsiaNews) - Chinese shares had their worst plunge since 2008. Benchmark Shanghai Composite Index tumbled by 7.71 per cent after falling by 8.5 per cent during the afternoon trading session. The Shenzhen Composite Index also lost 3.41 per cent. The loss follows the decision by the China Securities Regulatory Commission to punish three top brokerages for illegal activities in their margin business. China's securities regulator made the announcement late on Friday when trading had already ended, in the vain hope that it would not disrupt the markets too much. When trading resumed today, the market hit hard the three brokerages guilty of having illegally rolled over margin trading contracts. One decided to raise its minimum asset requirements on margin clients from 300,000 yuan to 500,000 yuan. For domestic and foreign analysts, the regulatory crackdown on margin financing spooked investors, causing Chinese share to nosedive. Insurance companies and banks also suffered major losses. The Shanghai Composite Index (SHCOMP) experienced its steepest drop since June 2008 when Citic Securities Co., Haitong Securities Co., and Guotai Junan lost big after the China Securities Regulatory Commission suspended them last Friday from opening new margin-trading accounts for three months due to irregularities. The regulator punished nine other brokerages for offences, including allowing unqualified investors to open margin finance and securities lending accounts. On the same day, the China Banking Regulatory Commission banned banks from lending to companies that borrow to invest in equities, bonds, futures and derivatives. Regulators may have been concerned that stock gains, partly driven by margin financing, were too rapid, this according to Hao Hong, a strategist at Bocom International Holdings Co. in Hong Kong cited by Bloomberg. In fact, between the end of June and 13 January, outstanding margin loans had surged from about 400 billion yuan to 1.08 trillion yuan (US$ 174 billion). Similarly, the Shanghai Composite jumped by 67 per cent in the past year as investors, big and small, piled into the market. Even Citic and Haitong had recently announced plans for share sales to fund an expansion of businesses. Hence, regulators became "concerned that shares" had "run too hard, too fast," Hao said. "They want a measured increase in the stock market. For Pauline Dan, from the Hong Kong-based head of Greater China equities at Pictet Asset Management Ltd., "China is trying to rein in over-bullishness in the stock market as moves have been exaggerated". The property market has also come under closer scrutiny. For the first time, a major investment holding company, Kaisa Group Holdings Ltd, missed interest payments worth US$ 23 million. Although the amount might appear to be small, it could be a sign that China's property market is near collapse. Real estate in fact represents about 16 per cent of economic growth. At the same time, Kaisa's failure to meet its obligations reflects a broader problem: political protection. The firm itself has been linked to a Communist official that is currently under investigation for bribery, a problem that has ballooned over the past decade as the authorities tolerated corruption and applied little regulatory oversight in order to maintain high levels of employment and investments.